LONDON--(BUSINESS WIRE)--Headline of release dated July 16, 2018, should read: Technavio: Global Pet Food Market 2018 - 2022 Report - Market Outlook and Analysis. The global pet food market report has been added to Technavio’s food and beverage research library. According to Technavio’s market research analysts, the market is expected to grow at a CAGR of more than 6% during the forecast period. This research report provides actionable insights to help you answer key questions surrounding the emerging trends, drivers, and challenges, that are projected to impact the global pet food market and its stakeholders over the forecast years. 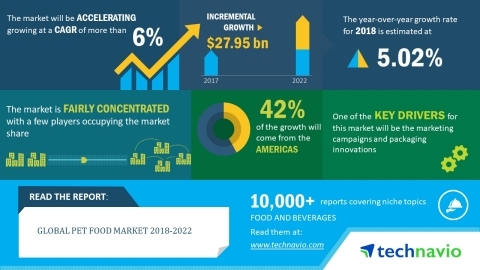 The global pet food market 2018-2022 report has been added to Technavio's food and beverage research library.